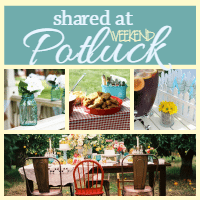 Crock Pot Easy Special Pot Roast - Recipes That Crock! This Crock Pot Easy Special Pot Roast is from the 5 Ingredients or Less section of Gooseberry Patch’s Everyday Slow Cooker is so easy and has a unique flavor that is delicious! When I saw the ingredients for this Crock Pot Easy Special Pot Roast, I was a little leery. I wasn’t sure how the three soups flavors would mesh, but thought I would give it a shot. Boy am I glad I did! We loved the unique, mouth-watering taste of this roast! If you know you are going to be in a hurry and need a quick recipe to throw together that can cook all day, then this Crock Pot Easy Special Pot Roast is going to help you out! It can be thrown together in just a couple minutes and cooks for 8-9 hours, so dinner can be ready and waiting for you when you walk in the door! Don’t you love not worrying about dinner when you walk in the door? I may work from home, but by the time dinner time rolls around, I am still thrilled to not have to worry about putting something together to feed my family. 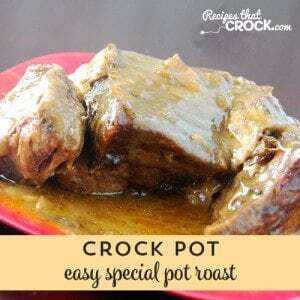 For this yummy Crock Pot Easy Special Pot Roast, I used my Hamilton Beach Programmable Insulated Slow Cooker. Clean up is a breeze, and I know I can count on Sir Hamilton to cook evenly. 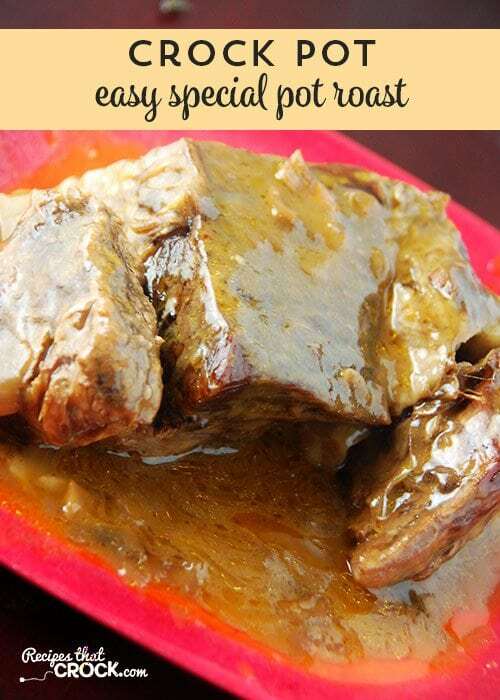 This Crock Pot Eay Special Pot Roast is not only easy, it is delicious! Do you add water to the soups? Or just leave them condensed? Just leave them condensed. If you need to add in the water, we’ll make sure and include it in the directions. Enjoy! Do you recommend adding carrots, potatoes or other seasonings while cooking? You could add in carrots and potatoes if you wanted to, just make sure you use a hard potato like a russet and not a soft potato like a red. The flavor is great in this roast, so extra seasonings aren’t really necessary. Let us know how it turns out! Enjoy! This looks so good. I will be making this as soon as we get cool weather. I am actually not a mushroom fan either, but loved this roast. If you still can’t convince him, you might try another cream or condensed soup. I haven’t tried it with a different kind though, so I can’t say for sure. Let me know how it turns out! Enjoy! Just make it, and throw all the cans away!!!! I have a son in law, who loves green bean casserole, but now refuses to eat it, because he saw the soup cans. I don’t like mushrooms myself, but never notice them in the recipes I make with soup. And, as for Golden Mushroom soup, I make a delicious dish from pork chops, onion, and golden mushroom soup, served over rice. That’s my philosophy! I hate mushrooms but love recipes with the soups once I actually tried it! In fact, one of my all-time favorite recipes is Slow Cooker Steak with Gravy! Do you spoon the soups over the top of the roast before cooking or just leave the soup underneath? Just put your roast on top of the soups and go! The flavor comes through wonderfully! Enjoy! Is there another soup besides golden mushroom that I can substitute??? I haven’t tried it any other way, but you could try substituting another cream or condensed soup. If you don’t like cream soups, you could even try a veggie soup. That would change it up a bit, but just trying to think of all your options. Hope that helps! Yes, you can add carrots and potatoes. Just make sure you use a hard potato like a russet. Enjoy! I haven’t made this roast yet but the picture looks delicious and sounds great too. I will try it later this week and give my opinion after I make this roast. For now just on the recipe itself and the picture I would give it 4 stars….. but after I make it then maybe it will be a 5 star recipe…. Can not wait for ur review before I make it!